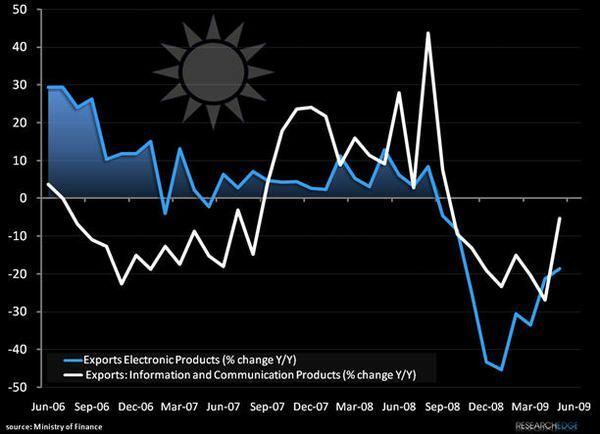 At -31.4%, Taiwanese export data for May released earlier today showed a sequential improvement on a year-over-year basis from April's figures. As anticipated, a major factor was an increase in shipments bound for the mainland, with PRC exports improving to -32.45 Y/Y, a massive improvement over January's bottom but still well below the single digit decline registered in February when the floodgates were initially opened by Beijing. Exports to the mainland accounted for 27.64% of total shipments for the month. As expected after multiple companies reported increased orders for flat screen panels and other components in the wake of Beijing's consumer rebate program aimed at rural residents, electronics producers continued to see increased shipments in may. Total electronics exports, a critical component at 28% of the national total, showed an improvement to -18.67% Y/Y. Information and Communication products -a modest component of the total at just 4.5% of total exports for the month, leapt to -5.38 Y/Y and actually crossed into positive growth territory on a 2 year basis. Less eye popping but still worthy of note were the heavy and light industrial categories, which also registered modest improvements for the month -signaling that improving external demand has broadened beyond just consumer electronics. 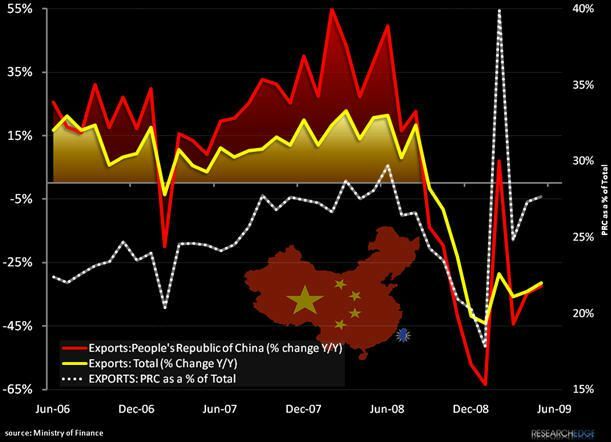 This latest data continues to support our bullish thesis on Chinese demand recovery, while also supporting our conviction that Taiwan and South Korea are positioned to recover more rapidly than Japan as Chinese buyers take advantage of currency valuation and political goodwill. Chart Of The Week: Second-Derivatives?